The President’s Award is the highest recognition given by NIA’s President and is not presented every year. 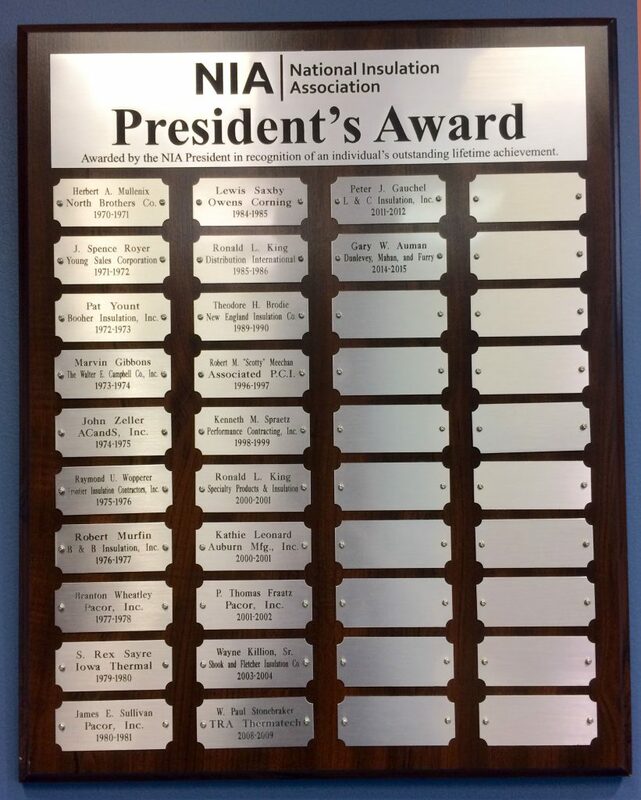 It is given to individuals who have demonstrated outstanding service and dedication to NIA resulting in accomplishments that have tremendous benefits for the association and the industry. 1970-71 Herbert A. Mullenix, North Brothers Co.
1972-73 R.F. “Pat” Yount, Booher Insulation, Inc.
1973-74 A. Marvin Gibbons, The Walter E. Campbell Co., Inc.
1975-76 Raymond U. Wopperer, Frontier Insulation Contractors, Inc.
1977-78 C. Branton Wheatley, Pacor, Inc.
1980-81 James E. Sullivan, Pacor, Inc.
1989-90 Theodore H. Brodie, New England Insulation Co.
1996-97 Robert M. “Scotty” Meechan, Associated P.C.I. 1998-99 Kenneth M. Spraetz, Performance Contracting, Inc.
2001-2002 Paul T. Fraatz, Pacor, Inc.
2011-2012 Pete Gauchel, L &C Insulation, Inc.